Valentine’s Day is just days away! Have you gotten everything planned out for your boo? We, on the other hand have something special coming up from today onwards up till Valentine’s Day! 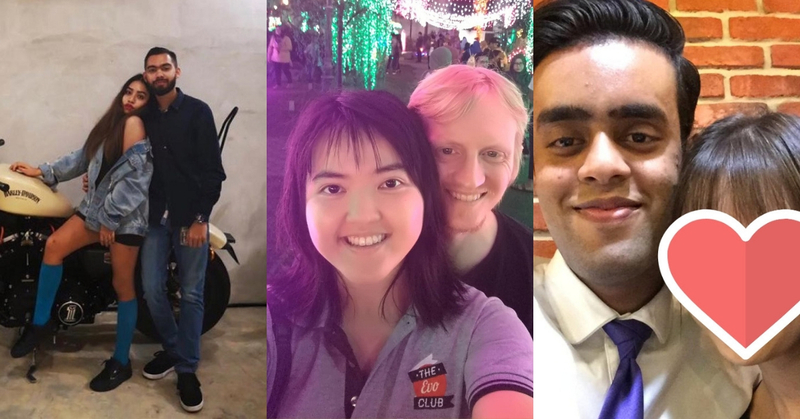 In the spirit of cupid’s bow, the team from Sevenpie got out of our way and approached a few couples who are obviously in love and would like to share a thing or two about their relationship to YOU, our dear readers. These couples may be someone you’ve been following on social media, some of them are also average Joes like you and I! But, regardless of who they are and where they came from, each and every one of them have a story to tell. And we hope that we all can pick up something from them and who knows, this might even shed some new found wisdom about LOVE. To make things a little more interesting, the couples that we’ve interviewed will share about topics that encompass various aspects, and we must add that some are rather unconventional. So if you’re toying around the idea of dating someone from a different racial background, we got that covered today. LGBT? Yes, that too (stay tuned for that), and finally, if you’re one of those who have your reservations about marriages, well, we got that covered too and it’s coming to you REAL soon! So, sit back with your boo, relax and enjoy reading because today’s article is all about intercultural couples! First off, we interviewed Presha and Sami because their unique traits are something that many of us can relate to. Presha is from Malaysia, while Sami is a student from Bangladesh. 1. Presha you are from Malaysia and Sami, you are from Bangladesh. Both of you are from two different countries. Was it hard getting used to each other’s cultures? SAMI: It wasn’t that hard, because I have already lived here for the past two (2) years. And naturally, I have adapted to the culture here in Malaysia. PRESHA: Yes, Because Sami eats different types of food and his taste buds doesn’t really match mine. But we compromise every time and it works for us! We usually eat foods that both of us enjoy like Nasi Lemak and Butter Chicken. Those are one of our shared favourites. 2. How did the both of you meet? Was it love at first sight? SAMI: We actually met in a night club (at Trec). Not the ideal place to start a relationship, but yes, that’s the truth. It was not love at first sight because we met and remained friends for some time, until it grew and turned into something special. PRESHA: Yes, we met at a nightclub. But no, it was not love at first sight because he came up to me in the club and we just became friends after that, but like he said, it grew to something better in time. 3. What are some tips that you think other couples who are culture different would need to know? SAMI: They must be open-minded as each of them have to adapt to each other’s culture. PRESHA: Sami came from Bangladesh and a lot of Malaysians don’t really have a positive view about them. So one tip that I would give is to be accepting, as you’ll never know to what extent any relationship can develop into! Plus, meeting people of different races and religion is something that may occur in anyone’s life, so be accepting and open-minded towards everyone you meet. 4. How was it like, introducing your significant other to your group of friends? Were your friends supportive of the relationship? SAMI: Yes, they were very supportive of Presha. PRESHA: They were very accepting! My friends are very important to me so the first time they met Sami was a very crucial moment to our relationship. But thankfully, they were so supportive of our union! The funny thing is that Sami and my friends got along really quickly, and they hang out with him very often these days and it makes me very happy to see my friends are so welcoming towards him! 5. Songs tend to speak to a person, especially in a relationship where couples have similar traits. Is there a song that reflects your relationship? SAMI: “We Found Love” by Rihanna, because we found love in a hopeless place, a night club (haha)! PRESHA: I have to agree. “We Found Love” by Rihanna really relates to how we met and we both love the song. It’s a head-banger! Next, we decided to interview Ryder who is from Australia and Su Yuan who is from Malaysia. Here, they talked about their journey as a long distance couple. Enjoy reading! 1. I know that Su Yuan is from Malaysia, and Ryder, you’re from Australia. How did the two of you met exactly? SU YUAN: We met through a writing forum where I had joined the site, years before Ryder did. Then, we were introduced by a mutual friend who noticed that we had really similar writing styles. We bonded through it and in turned out great. Our feelings for each other developed. It took us many months after to initiate a video call and plan for our first meeting. At the end of August, last year, we met for the first time in Singapore as I was working there at that time. RYDER: We met through a mutual friend, all three of us were on an internet site for writing enthusiasts that give each other scenarios and practice together. This friend noticed our styles were similar, and she introduced us, and we quickly became friends and wrote together and talked often for many months, and we got along so great, and we became close even though we didn’t even know what the other person looked like or where they were from. But with intense feelings developed this was soon revealed and then she confessed first (the bravest) and I confessed in return. We continued chatting about everything there was and getting closer and closer till I booked a flight to meet her and we got along great in person as well and went on dates and decided to enter a relationship together. 2. How has distance helped you both grow as an individual? SU YUAN: I did assume that being in a relationship is rather scary. I have assumed that it left little time for yourself which meant that you have no chance to grow as an individual. However, I realized that it was quite the opposite because I have learned more about myself with Ryder than I did with myself. It allowed me to understand my interests, my fears and my beliefs while being able to develop various parts of myself for the better. RYDER: In the past I had never been overseas before due to extenuating circumstances and responsibilities and had convincingly lied to myself it was not something I wanted to do. But our distance got me to overcome that denial and soon I had my passport and booked my flights. 3. I see that you both are pretty adventurous. Whenever Ryder is in town, you guys would travel to different places. What are your favourite memories together? SU YUAN: One of my favorite memories together is when Ryder taught me how to swim at Sunway Lagoon. It was later through the day when the park was closing where we managed to sneak into it. Also, it was drizzling at that time and we were just holding onto each other for warmth. It was great despite the fact that I pulled the muscle on my leg while attempting to swim. RYDER: For me it’s always the way her face sparkles when we reunite after being apart overseas, each time is etched into my brain. It’s also all the little things that our adventures gift us that end up being what I take from them, spontaneously dancing together in public after the high from a theme park slide, wrapping her up when she’s scared from a haunted house and feeling her heartbeat calm at my touch, laughing so hard at something we saw that we forget what we were laughing at by the end, a beautiful view from a lookout being overshadowed by getting lost in each other eyes. 4. What is one piece of advice you would give to someone who’s about to commit to a long-distance relationships? SU YUAN: Put in the effort to spend time with one another despite being far away. Video chat, play games, send messages, etc, whatever you can do, just do it. If you lose communication, you lose your relationship. With the Internet, it is a lot easier to keep in contact but many forget that it is a conscious effort to be made. RYDER: Make sure to have daily interaction and plan lots of activities to do together. Watch things together, play games together, share funnies, do something creative together, send a surprise selfie, have a terrible pun battle, while there are some limitations it doesn’t mean your relationship is on hold when you are apart. If your data allows take them for a walk and show them parts of your life, make it so they can imagine your world when they are apart from it. There are going to be times when they or you are sad and you would give anything to just hold them in person, this will be hard there’s no way around it. Have a real plan in place that will bring you closer in the future for you both to hold onto. SU YUAN: Love is when you are in a crowded room, but your sights are focused on only one person. It is when everything goes to hell but you are still in heaven. Love is the epitome of a contrast where everything is black and white but still colorful. It is when you feel pain but it brings you happiness for knowing it. There is no proper definition of love, it is how you make of it. RYDER: Love is intensity, reality as strong as it gets, nothing can bring elation, fear, pain, contentment, and happiness like love can. Love is to give someone a residence in your heart and mind, all of them, so that you find yourself loving every part of them, even what others might call flaws are charming quirks because you’ve come to understand this person on such a deep level. Love is the desire to help that person reach their dreams and for them to be the person you want by your side as your reach for yours. Lastly, Beth* (not her real name) and Manesh. Both of them are from Malaysia but they are two different races which is a problem to a lot of people here in Malaysia. So we decided to hear their story to see if race is an issue in their relationship. 1. How did you first fell in love with each other? MANESH: From the time she walked into Sukiya (first place we met), I went DAMN. Then when we started talking at Uncle Don (after Sukiya) and I went DOUBLE DAMN. We clicked the most at Stevens Corner (after Uncle Don) which made me go TRIPLE DAMN. After I got home all I could think about is Beth, and how did I not get her number. Then the next few days I was thinking how I can get her number. With the help of a close friend of mine I managed to add her on Facebook. She accepted almost instantly, and we ended up chatting till 3.30am and I had work the next day at 7:30am. I did not regret doing that at all (yes I was tired but it was worth it). It was just so easy to talk to her because we connected so well. 200,000+ messages in 5 months and we still have so much to talk about. Even when we are in the same place but not doing the same thing it feels nice to have her vibe around. 2. Who puts in more effort? BETH: I’d would say that it’s him because he really goes through a lot for me and does a lot for me which I’m grateful for, but he’s going to say he disagrees, so I should say it’s 50/50 (haha)! MANESH: Hard to tell but I feel she does more (haha)! 3. When did the relationship begin? BETH: Four months ago. It was a month after we first met, and it was on our 6th date. MANESH: 6th of October at Tryst. 4. Do your parents approve of you both being together? BETH: Well my parents don’t really know about us officially, yet. They have no issue at all me dating someone of different racial background. What matters most in my household is that the guy that I’m dating eventually comes to believe in the same religious faith as me. MANESH: My mom yes and I’m sure my dad would too! 5. Do you believe that love prevails above all? BETH: Realistically, in life there may be some things that it doesn’t overcome, but yes, I hope and would like to believe that it does. MANESH: Well, is most cases yes. Though there are some things that love alone isn’t enough. Love is definitely in the air here! If you want to read more about love stories from real people, stay tuned because we will be releasing more Featured Interviews leading up to Valentine’s Day!